Welcome to day 3 of 31 Days of 15 Minute Craft Projects. 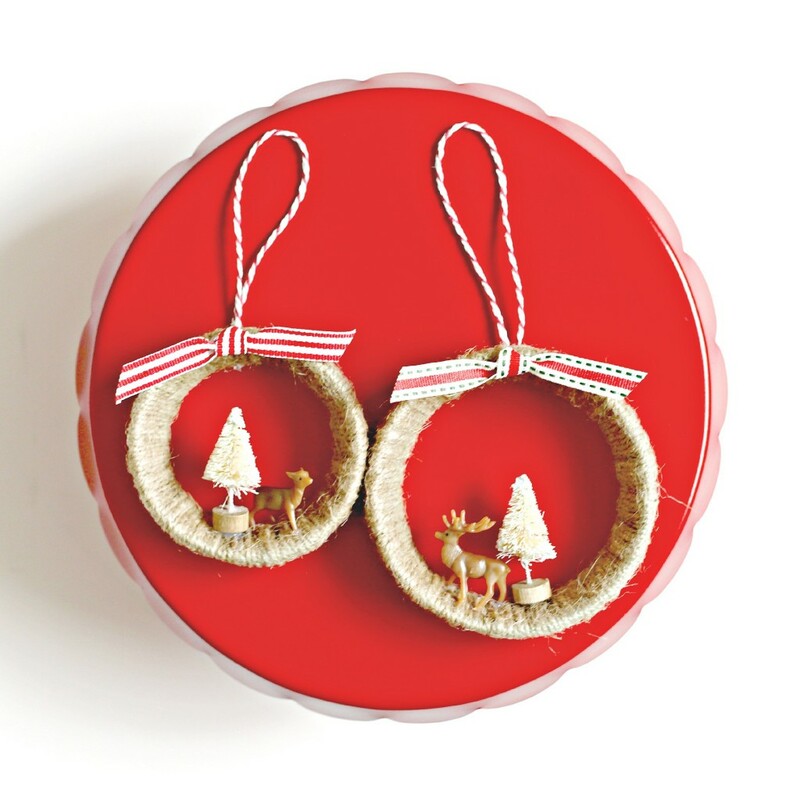 We will be crafting these adorable Mason Jar Lid Ornaments today. 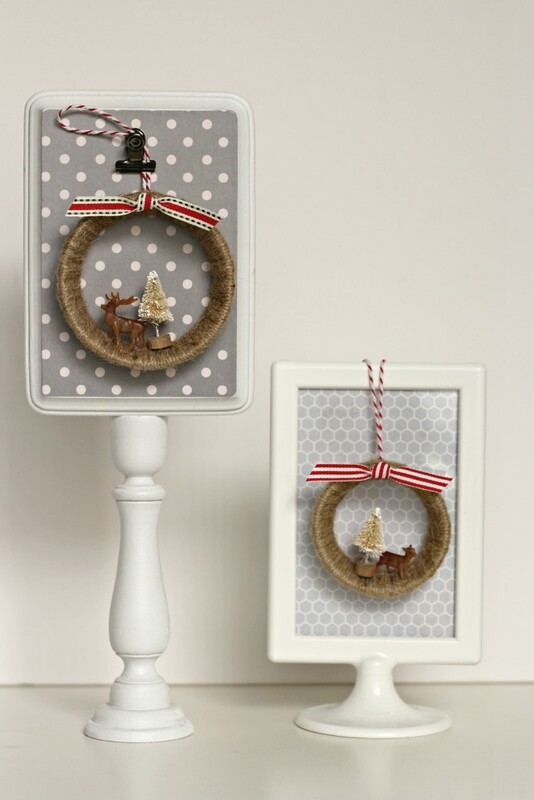 It’s never too early to start thinking about Christmas ornaments, right? Especially ones that only take 15 minutes to make. Don’t be surprised if you already have everything you need around the house to make these. I have to be honest with you, wrapping the lid ring takes up 95% of the time in this project. 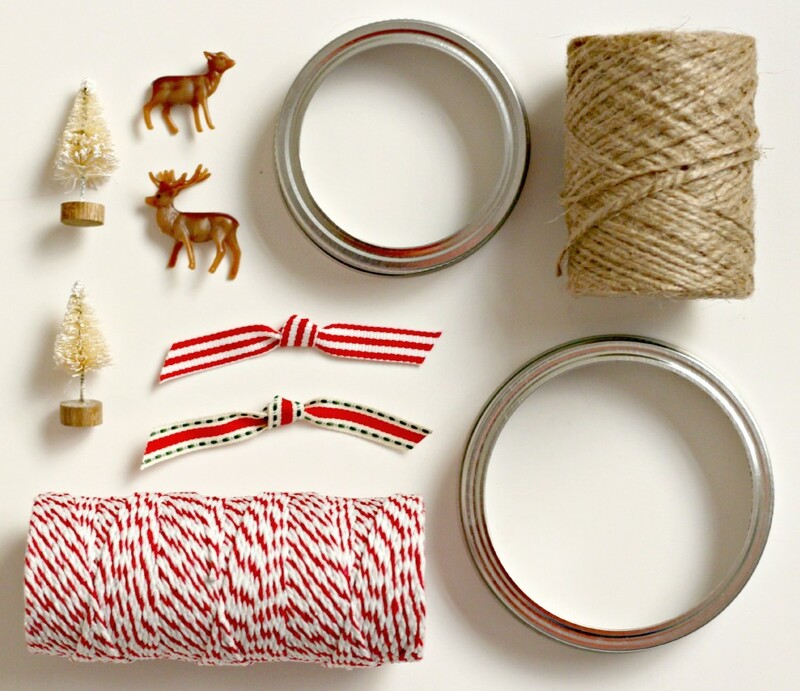 The width of the ribbon or twine really depends on how long it will take to wrap the lid rings, so in other words get a thick twine or wrap really fast. 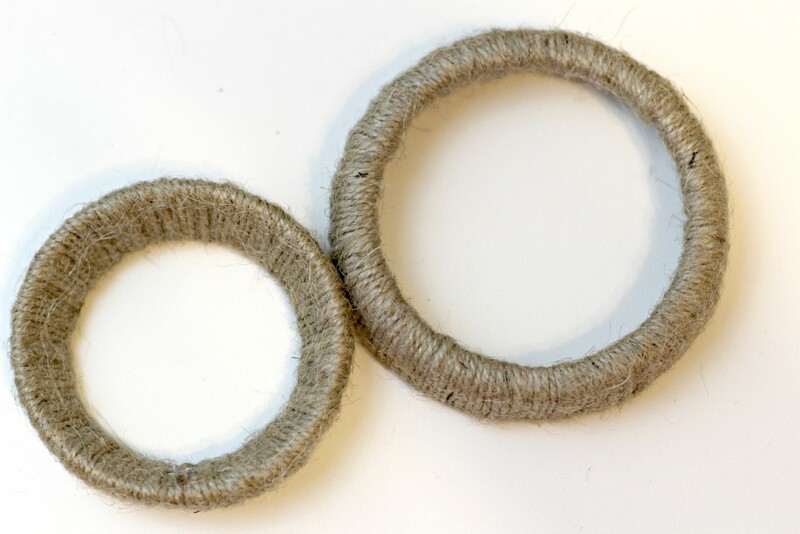 Use hot glue to secure the ends of the twine to the ring. You can turn the ring whichever way you like. I used the inside on this project because I liked how it looked (the one on the left). Hot glue the mini trees and mini deer in place. They’re pretty adorable! Most craft stores carry mini figures, especially for Christmas. There are many to choose from so you can make any scene you like. I like the simplicity of the trees and deer. Tie a loose knot in the center of the ribbon and hot glue it to the ring. 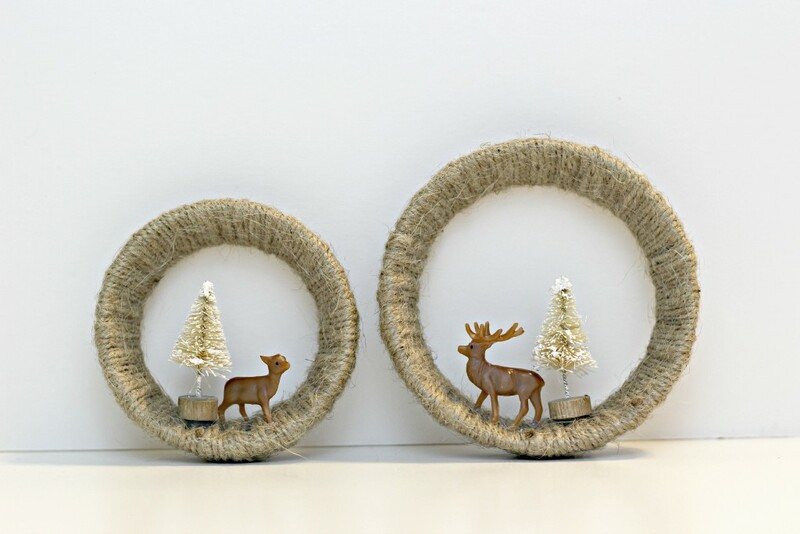 Make a loop with the bakers twine and hot glue it to the back of the ring, directly behind the knot on the ribbon. Obviously I don’t have my Christmas tree up yet so I can’t show them hanging on the tree but I love how they turned out. I think I need to make 10 more to make a dozen. Maybe we’ll have a family craft day. By the way, I love this red cake stand I bought last year. You can bet it will be showing up around the house this Christmas. One more look, cause they’re so dang cute! These are so sweet! I agree- the simple deer and tree are so perfect! What a cute ornament Leanne! And easy enough that even I could do it 🙂 Pinning so I can make it closer to Christmas. These are so cute, Leanne! Love your website and your 31 days series . 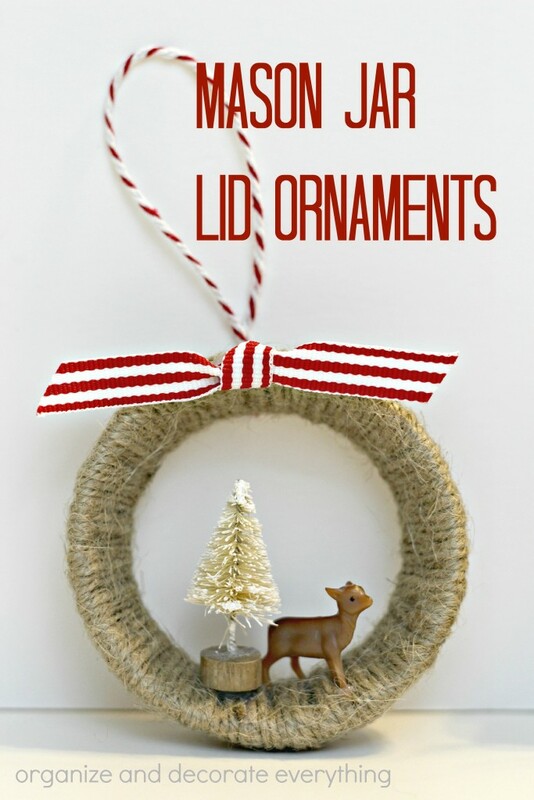 The xmas ornaments are so easy to make. Thank you fir this quick and easy way to make my xmas a little extra special. What are the heights of the miniature bottle brush tree and plastic miniature deer in the mason jar lid? 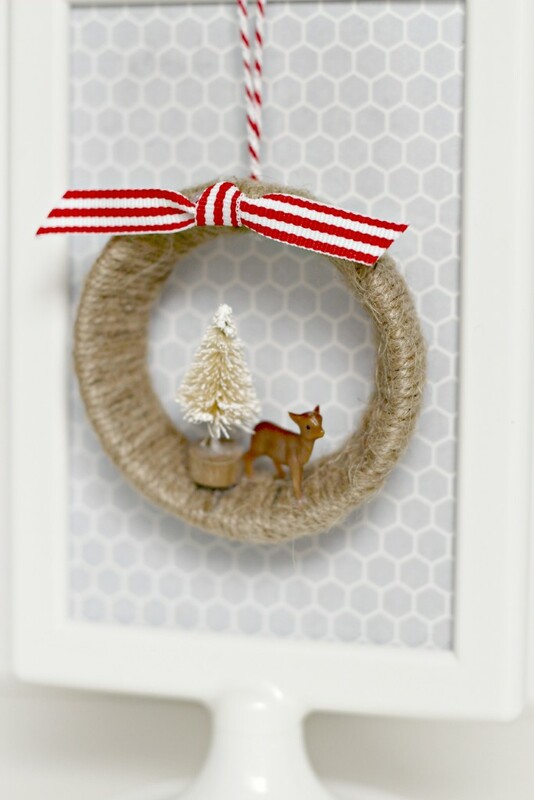 What are the heights of the miniature bottle brush tree and the miniature plastic deer in the mason jar lid wrapped in twine craft?